Use the form below to add your items and create your party pack. When ready, click book now, and we'll confirm your order! Choose a Party Pack and Save! Perfect for all those little boys that love Batman! Every little girl deserves to be a princess on her birthday! Great for kids that love exploring with Dora & Diego! Have your favourite jungle characters in your own backyard! For the Lil Girls with Big Fashion Sense! Get your favourite Spiderman Jumping Castle here! 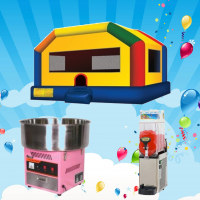 This HUGE Jumping Castle is fun for all ages! Great for those big kids out there! 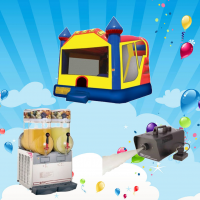 This Combo Jumping Castle is fun for all ages! Great for those big kids out there! 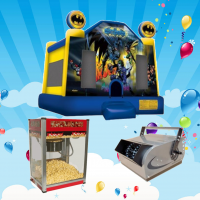 If you love Lightning McQueen, you'll love this Jumping Castle! Perfect for all little princesses and their birthdays! Spooky Scooby-Doo!! Perfect for your next party. Scooby-Doo Interactive Bubble Jumping Castle is suitable for boys and girls of all ages. It comes with a completely open front entrance and has 2 slides! The Disney Princess 5 in 1 Combo Jumping Castle is our absolute favourite Jumping Castle for a little girls birthday party! Our latest addition to the Castle family! Great Jumping Castle when you don't want a theme! Mechanical bucking bull hire in Melbourne and its surrounding areas. Enjoy the very latest bull riding experience for beginners, children and adults. Mechanical Football hire in Melbourne and its surrounding areas. Enjoy the very latest riding experience for beginners, children and adults. Mechanical Surfboard hire in Melbourne and its surrounding areas. Enjoy the very latest riding experience for beginners, children and adults. 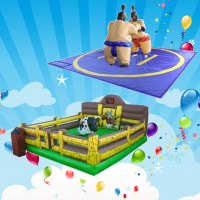 Sumo sized fun! You'll have almost as much fun watching the action as trying to body slam your opponent. 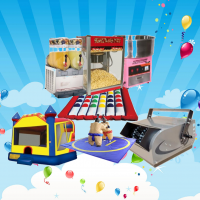 Look for something different for your child's next party? This is absolutely HILARIOUS! Fun to watch and even more fun play. A fun twist on a family favourite. A steady hand is a big advantage in this game. How tall can you get the tower? Smoke Machines are great fun for disco parties! 3000+ bubbles per minute. Ideal for backyards or football ovals! 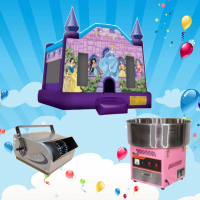 Fairy Floss Machine in a perfect size for backyard parties! 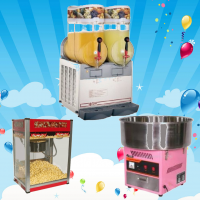 Popcorn Machine provided with instructions, ingredients (corn, oil, flavour salt, bags) for up to approx 50 serves. Our Single Bowl Slushie Machine makes up to 50 drinks! Our Twin Bowl Slushie Machine makes up to 100 drinks! Our Generators are great for hire with our Jumping Castles if you are planning your event in a park or open space. These are standard trestle tables for hire. Weighted objects are used if the surface type does not allow pegs. Great if you're expecting a large crowd at your event! Hire Duration --Select-- 2 Hours 2.5 Hours 3 Hours 3.5 Hours 4 Hours 4.5 Hours 5 Hours 5.5 Hours 6 Hours Overnight (N/A For Mechanical Bull) How long do you want to hire the equipment for? Preferred Setup Time --Select-- 8:00 am 8:30 am 9:00 am 9:30 am 10:00 am 10:30 am 11:00 am 11:30 am 12:00 pm 12:30 pm 1:00 pm 1:30 pm 2:00 pm 2:30 pm 3:00 pm 3:30 pm 4:00 pm 4:30 pm (Mechanical Bull Only) 5:00 pm (Mechanical Bull Only) 5:30 pm (Mechanical Bull Only) 6:00 pm (Mechanical Bull Only) 6:30 pm (Mechanical Bull Only) 7:00 pm (Mechanical Bull Only) 7:30 pm (Mechanical Bull Only) 8:00 pm (Mechanical Bull Only) 8:30 pm (Mechanical Bull Only) 9:00 pm (Mechanical Bull Only) 9:30 pm (Mechanical Bull Only) When you'd like the equipment to be in operational by. Do you require equipment supervision? Number of Supervisors Required --Please Select-- 1 2 3 4 If you need more people or hours, please call us to discuss or tell us in the booking notes. * First Name The person who's hiring the equipment, this is usually you! * Delivery Address The physical street address. 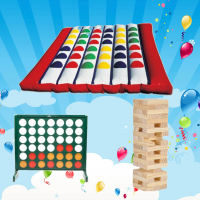 * Event Type Birthday Party Christmas Party Wedding Christening Sporting Event Promotional Event Fundraising Event Other Extra Event Notes (other) Please describe your event type if other. * Surface Type Grass Fake Grass ($50 Surcharge applies) Dirt Gravel Concrete ($50 Surcharge applies) Indoors Asphalt ($50 Surcharge applies) Other Extra Surface Notes (other) Please describe the setup surface if other. * Is There 1.5m Access? --Please Select-- Yes No We require 1.5m wide access to the setup area, Please advise if there is any restricted access such as stairs, narrow gates, steep driveway etc. * Power Available? --Please Select-- Yes No The items will need to be within 25m of mains power. Any other special instructions, comments or questions. A deposit is required to secure your booking. We'll let you know the amount when confirming the price for you. Balance payment can be made by cash, on the day at the time of set-up.